Rogue military personnel? Or a deliberate policy of abuse? Day 6 of our 7 day series on alleged abuse by British soldiers in Iraq. 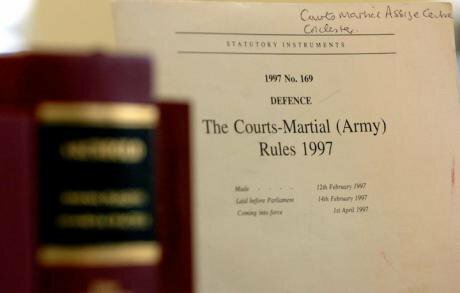 Documents in the military court room in Colchester, Essex, where four soldiers and three ex-soldiers accused of the murder of an Iraqi civilian stood trial back in September 2005. Corporal Scott Evans, 32, Private Billy Nerney, 24, Private Samuel May, 25, Private Morne Vosloo, 26, and former Privates Daniel Harding, 25, Roberto Di-Gregorio, 24 and Scott Jackson, 26, were accused of murder and violent disorder following the death of Nadhem Abdullah on 11 May 2003 in a roadside incident in Al U'Zayra. The case eventually collapsed and the men were cleared. The judge criticised the poor handling of the case by the Royal Military Police's special investigations unit. PA/Chris Rayburn. All rights reserved. By 2010, the number of allegations of unlawful killing and abuse in detention had ballooned. Public Interest Lawyers (PIL) had registered 141 different claimants before the courts and the Ministry of Defence by 21 October of that year. They were gathered as one case, called Ali Zaki Mousa, after the first Iraqi on the list. PIL argued that the range of ill treatment alleged by these claims suggested “systemic abuse”. In other words, it was not just the result of rogue military personnel but indicated a deliberate policy of abuse to break detainees as part of interrogation — or at best a failure by the military and political establishment to investigate, prevent and punish such practices effectively. All the Five Techniques that appeared in the Baha Mousa case, with religious and sexual humiliation added, were used across 14 military facilities, PIL said. That alone pointed to an institutional pattern which could be rooted out only by an over-arching independent public inquiry. The Ministry of Defence accepted that the allegations were sufficiently “credible” although it didn’t accept that they were necessarily true. It also acknowledged, following the Al Skeini judgment of the European Court of Human Rights, that it had a duty to investigate both the individual claims and the possibility of military systems contributing to abusive practices. But it did not accept the call for an inquiry. In court, the MoD argued that it would be far too costly. Instead, it set up a convoluted alternative structure that was eventually approved by the high court. First, the MoD recruited a retired senior civilian police detective, Mark Warwick, to lead a 145-strong team made up of military police personnel, civilian investigators and civil servants. Called the Iraq Historic Allegations Team (IHAT), the unit was supposed to deal with the investigations of the multiple claims. The priority was what the Court came to call, rather insensitively, the “death cases”. If IHAT finds sufficient evidence of a serious crime, it refers the case to the military’s Director of Service Prosecutions, who decides if there is a realistic prospect of conviction and if it’s in the public interest to prosecute. Up until August of this year, IHAT had been referred 1,668 allegations, 325 of unlawful killing, and the rest ill treatment “ranging from serious sexual assault to common assault”. After six years of operation, it has completed investigations into 176 of these cases. Publicly available information is thin on detail, but of these, two have been referred to the Director of Service Prosecution (who has decided not to prosecute) and one soldier was referred to his Commanding Officer for an unspecified crime and fined £3000. The remaining 1,492 allegations are still under review. IHAT announced that they would be continuing their work until at least 2019. Sir William Gage, chairman of the Baha Mousa inquiry. Anthony Devlin PA Archive/PA Images. All rights reserved. In the case of Baha Mousa, where the circumstances of his death and the perpetrators of assault and ill-treatment are irrefutable following Sir William Gage's detailed public inquiry, IHAT has been unable to complete its investigations. In September 2013, on the 10th Anniversary of the killing, IHAT announced it was pursuing “new lines of inquiry”. Nothing has been heard since. It’s not the only case left hanging. In 2014 IHAT reported that in one case of alleged unlawful killing, when an Iraqi prisoner died whilst being transported in an RAF helicopter, it had finished its review and referred the matter to the Royal Air Force Provost Marshal “for consideration”. That’s shorthand for saying something suspicious may have occurred. All that has happened since, according to IHAT, is the Provost Marshal has “directed further investigation”. No one is saying what that entails. The case of Memmon Al-Maliki has also been left in limbo. Memmon was a 12 year old boy who was severely injured after he picked up a shell that exploded in his hands. He was taken to a British army base for emergency treatment and transferred to the British Field Hospital in Basra. The family never saw him again. The army said they had records of the boy’s transfer to an American hospital in Kuwait. But the US had no such information. IHAT reported that they met with the boy’s father and explained what they had found. There was nothing more they could do, they said, and the case is closed. Frustrated by the delays in getting to the bottom of these cases, either to dismiss them or take action against possible culprits, Public Interest Lawyers with the European Center for Constitutional and Human Rights contacted the Office of the Prosecutor at the International Criminal Court in the Hague at the beginning of 2014. Fatou Bensouda, the Chief Prosecutor, announced they would begin a preliminary examination into the matter. Her Office representatives have visited the UK to look at IHAT’s operations. They are keeping a watching brief on what’s happening at this stage, no more. A state is left alone to investigate its own alleged crimes unless its efforts do not appear genuine. That point hasn’t been reached, as the ICC reported on Tuesday this week. They are still examining the evidence. 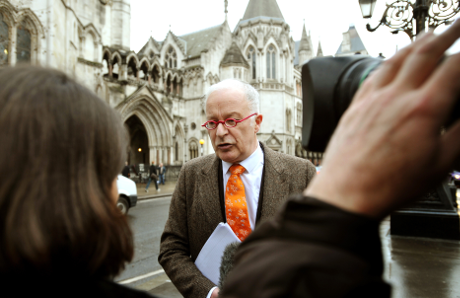 Solicitor Phil Shiner outside the high court in London ahead of a judicial review on behalf of 180 Iraqi civilians. John Stillwell PA Archive/PA Images. All rights reserved. The Iraq Historic Allegations Team was not the only process of inquiry approved by the court in Ali Zaki Mousa. The Minister of Defence established an Iraq Fatalities body in 2013 that will act as an inquest into only some Iraqi deaths. 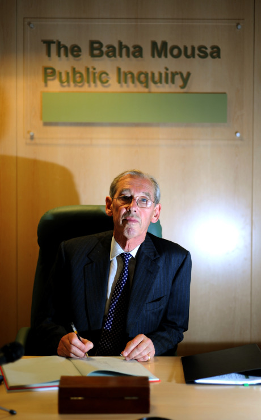 Where cases of alleged unlawful killing have been inadequately investigated and have led to unsuccessful courts martial (the Minister has estimated there may be 11 of these cases), Iraq Fatalities Investigations (IFI) will publicly examine what happened. The families concerned are consulted, but these are not criminal proceedings. The IFI is precluded from determining any individual or collective liability. Sir George Newman, a retired High Court judge, was appointed as the IFI chair. So far six killings have been referred to Sir George. He’s reported on four. In the first, Nadhem Abdullah’s case, he found soldiers had used excessive force which led to Abdullah’s death. Defence Secretary Michael Fallon accepted Sir George’s findings in a parliamentary statement. He announced in March 2015 that in “the light of the facts as found by Sir George, and in particular the finding that excessive force was used, I wish to express the Government’s regret at the death of Mr Abdullah”. Appropriate compensation would be paid to the family, he wrote. In two other cases completed in the past year, Sir George found sufficient evidence to suggest that the soldiers involved had killed in self defence. His conclusions on the drowning of the 15 year old boy Ahmed Ali were released in September. Evidence of torture, but . . . So, despite an inquiry finding that Baha Mousa had been unlawfully killed, that the Ministry of Defence had “forgotten” that abusive interrogation techniques should not be used, despite “credible” allegations accumulating from Iraq, despite Camp Breadbasket and the IFI substantiating claims of two needless deaths at the hands of British soldiers, why is it the government and Theresa May have turned on the lawyers acting for the Iraqis? And why does Michael Fallon, the Defence Secretary, say the legal system has been abused “to falsely accuse our armed forces”? Tomorrow: Why have the Iraq allegations become “vexatious claims”? And what should justice look like in the Iraq cases?